Clash served only in the Royal Navy. Transferred to the War Shipping Administration 15 January 1948, sold into commercial service and renamed Porto Offuro. Propulsion: Two 3-drum express boilers, 2,750ihp vertical triple expansion Port Arthur Shipbuilding Co. engine, one shaft. 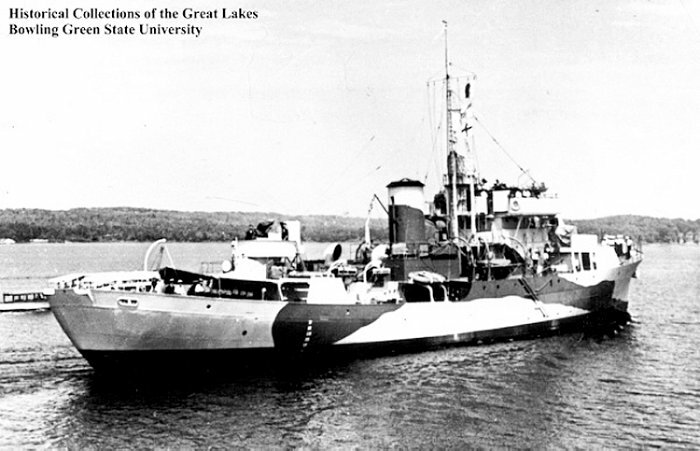 Clash (PG-91), formerly CN-309, was launched 18 November 1942, by Midland Shipyards, Ltd., Midland, Ontario, Canada, for the U.S. Navy. Upon completion Clash was transferred to the Royal Navy on 19 June 1943 and commissioned as HMS Linaria. On 27 July 1946 she was returned to the U.S. Navy. Never commissioned in the U.S. Navy, Clash was sold on 15 January 1948. A British name retained; a common plant having showy orange and yellow flowers and known also as toadflax (Linaria linaria). Clash (PG-91) (q.r.) was renamed HMS Linaria upon transfer to the United Kingdom under lend lease 19 June 1943.